Progressive metal band Rusty Eye began in Mexico City in 1995 but have called Los Angeles their home for several years now. Musically, they’ve blended various elements and sub-genres within the progressive metal blanket throughout their career, and when it comes to the lyrics and imagery, they’ve followed a horror-based theme. Having been a three-piece band for the longest time, they went through some lineup changes recently and are now back to being a trio with Mr. Rust on bass and vocals, Baron Murtland on guitar and Justin Lack on drums. 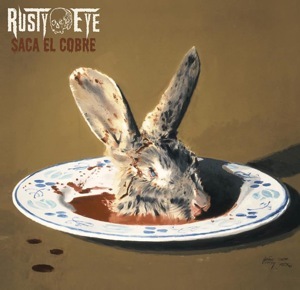 While they continue to work on new material, they’re getting ready to release an all-covers album called ‘Saca El Cobre’, which consists of Spanish covers of songs by Mexican music legends, along with a Spanish version of the Rusty Eye original ‘Mr. Cannibal’. On February 5th 2014, the three members of Rusty Eye spoke to Metal Assault about the past, present and future of the band. Watch the 11-minute chat below.